This book has had amazing reviews at Audible as well as in the media and a friend whose reading tastes I respect recommended it – I’m just now getting to it. In 1935 and 1936, while Adolph Hitler was organizing his new regime in Germany, producing propaganda, deploying his rearmament into tender parts of Europe, enforcing the new Nuremberg laws, as well as secretly building future concentration camps, and while United States and Western Europe were struggling in the depths of the Great Depression, the University of Washington was readying its rowing team for the next season. 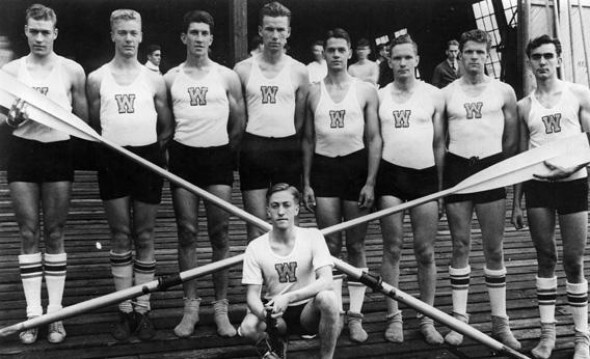 This book is about that team and how it was developed and trained and eventually went from being a group of back-water boys from a relatively unknown school to winning a Gold Medal in rowing at the 1936 Olympics in Berlin – same year Jessie Owens won the gold medal for the sprint and long jump. The major players included are Joe Rantz who had a seriously hard-scrabble life yet managed to get into the university, George Pocock who had built great boats in England and wanted to try it in the US, and Al Ulbrickson, the renowned coach. There are several other highlighted characters of course – Rowing is a whole-crew effort – there can be no stars – and that’s a major theme of the book. 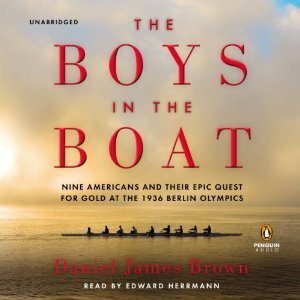 Brown does an excellent job of intertwining the tale of the rowers as a team and sometimes individually, as well as about everything connected with the sport as well as the boat itself to the uniforms, the training, the press coverage and the travel – even the psychological connection the team members had to make with each other to make the win. The races themselves are wonderfully described and those sections are interwoven with sections dealing with the rise of Hitler and bits about the Great Depression, the lives of the main subjects, (especially Joe Rantz) techniques of boating, etc. The thing is, we know the end of the boys’ Olympic story or there wouldn’t really be one. So the fascination in the tale is in the details – the odds were so against the team in so many ways, Washington State was considered the outback of the United States, the lives of the boys were fraught with so many struggles – the chronology of events was rigorous. But it seems Brown wrote the book because he seems to really care about the team, especially Joe – whom he met – and the coaches. The tension is created in the personal stories as well as in the growing presence of Hitler in Europe. In some ways the book is like Eric Larson’s In the Garden of the Beasts where we knew what Hitler was up to, but we didn’t know the details of the life of Martha Dodd Stern(the daughter of the US ambassador) and her time there. I highly recommend this one – in fact – I ordered it for my 16-year old granddaughter who is a really excellent volleyball player – loves the sport – and I think she’ll enjoy the story as well as the lessons. This book is the selection for my local face-to-face book club. I was going to skip it, but you are making me think twice against that. Oh do give it a shot, Jim – the Audible version had me up very late – well worth it! Good narrator, everything.